State Representative Rick Miller (R-Sugar Land) talks a lot about fighting for Texas families and children. But his cozy relationship with fringe, anti-science special interests is putting them at risk. 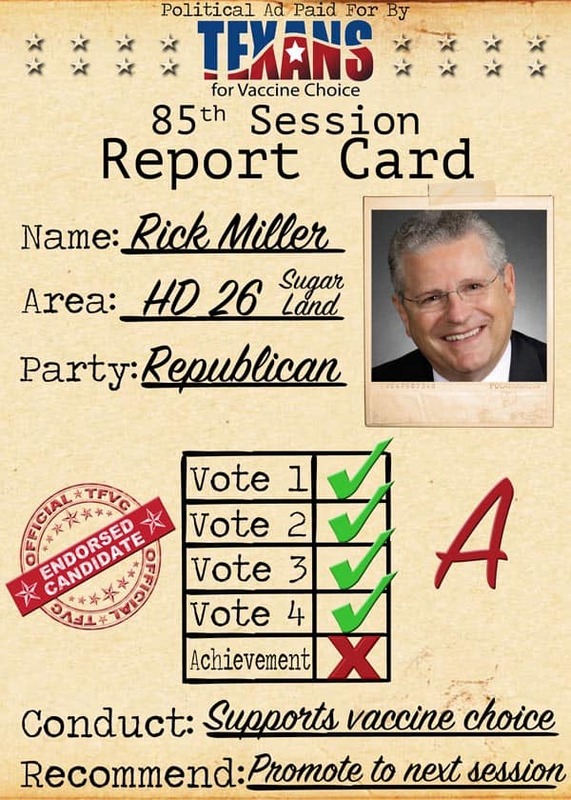 Miller has received an “A” grade, accompanied by an endorsement from Texans for Vaccine Choice, the fringe group responsible for pushing to weaken mandatory vaccinations for school children. Miller’s behavior is irresponsible, especially in light of the growing anti-vaccine movement in Texas, which is happening at the same time a number of Texas cities have become “hotspots” for preventable diseases. Rick Miller is out of the mainstream on this issue. If Texans can’t trust Miller to guard the health and safety of their kids, what can they trust him to do?